BOSTON – For so many of us born in the years after World War II, Carole King, her late former husband Gerry Goffin, and their close friends Barry Mann and Cynthia Weil provided the soundtrack and background music as we grew up in the 1950’s, 1960’s and 1970’s. They did it by writing the hit songs for the great performers of the day, such as The Drifters or The Shirelles, before King made a bet on herself as a performer in 1971 and recorded her life-changing “Tapestry,” still going strong with more than 25 millions albums sold. 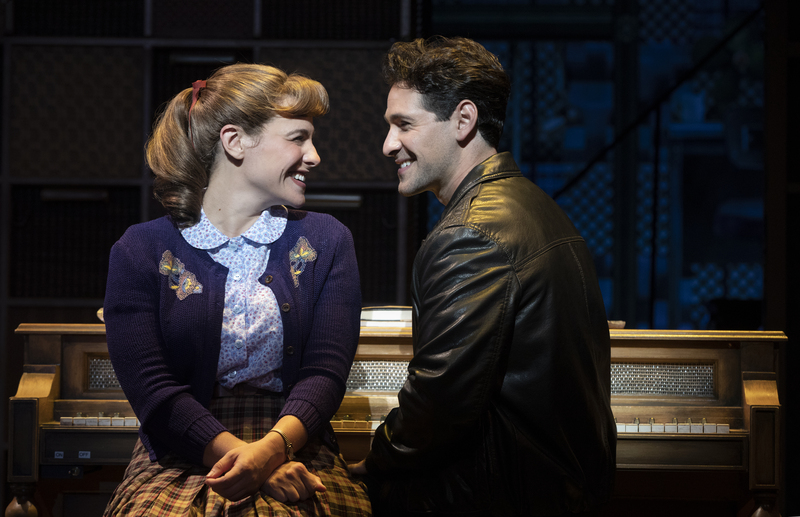 “Beautiful: The Carole King Musical,” now at the Opera House through Feb. 10 covers the period of her life from the age of 16, when she began writing professionally, to her triumphant Carnegie Hall concert on June 18, 1971, her first concert performance in front of an audience. 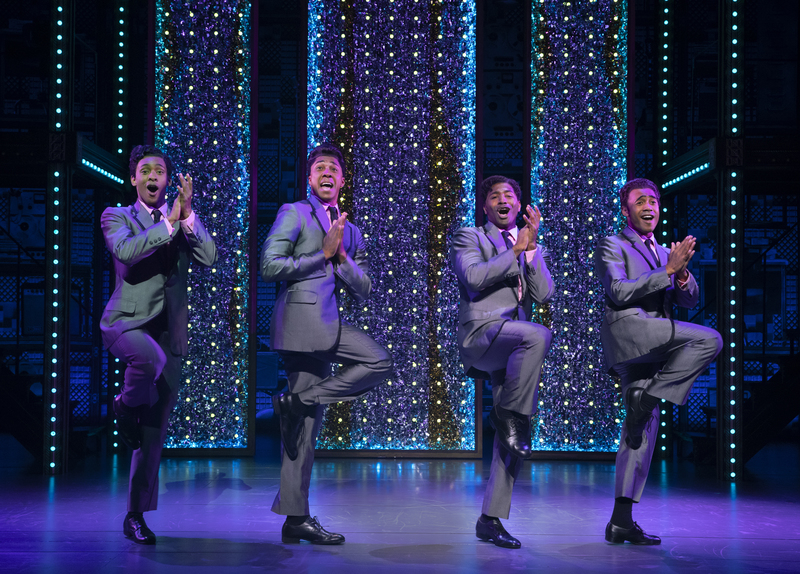 And while her story and the musical’s book by Douglas McGrath aren’tt quite as compelling as that of another jukebox musical, “Jersey Boys,” with its prison time and mobsters, there is enough angst and drama to keep you involved and entertained in the moments between the 27 musical numbers. “Beautiful” was nominated for seven 2014 Tony Awards and won two – for Jessie Mueller in the lead role and another for sound design. The former Carole Klein, played by Sarah Bockel here in Boston through Feb. 3, before Kaylee Harwood and Elise Vannerson take over, came out of Brooklyn not as a stunning beauty, saying about her looks — “I have the right amount of body. It’s not organized properly” – but as a stunning talent, smart enough to skip two grades and attend Queens College at the age of 16. Very few women have had a hit song written about them (Neil Sedaka’s “Oh Carol”) by a high school boyfriend and then gone on to co-write a No. 1 hit (“Will You Love Me Tomorrow?”), all by the age of 17. Bockel does well in replicating the distinctive timbre of King’s voice and also standing tall as an actress. At a very young age, King and Goffin joined the stable of writers and musicians in the Manhattan music emporium of impresario Don Kirshner (James Clow), grinding out hit after hit for the biggest names in pop and rock music. 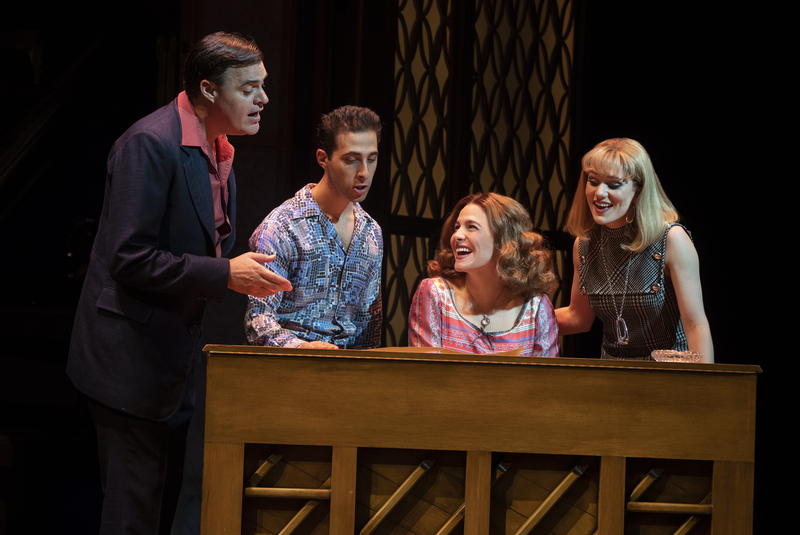 Goffin wrote the lyrics and King the music as the partners became friends with their “next door neighbors,” Barry Mann (Jacob Heimer) and Cynthia Weil (Alison Whitehurst), who became music icons in their own right, and friendly competitors. One of the best parts of “Beautiful” is the superb staging of the musical numbers, especially “Will You Love Me Tomorrow,” written by Goffin and King for The Shirelles (Harper Miles, DeAnne Stewart, Danielle J. Summons, and Alexis Tidwell) ) and “On Broadway” (Mann-Weil) and “Up on the Roof” (Goffin-King) performed by The Drifters ( Darius Delk, Dimitri Joseph Moise, Deon Releford-Lee, Nathan Andrew Riley), accompanied by some spot-on choreography by Josh Prince. With the huge songbooks available to producers, the 27 musical numbers include beloved songs written by Goffin/King and Mann/Weil such as “I Feel The Earth Move,” “One Fine Day,” “(You Make Me Feel Like) A Natural Woman,” “You’ve Got A Friend” and the title song. King on Jan. 12 joined the Broadway cast of “Beautiful” to sing “Beautiful” and “I Feel The Earth Move” to celebrate the fifth anniversary of the musical’s opening on Broadway. But her legacy as both a songwriter and singer – more than 400 0f King’s songs have been recorded by more than 1,000 artists, and both she and lyricist Goffin were inducted into both the Songwriters Hall of Fame and the Rock and Roll Hall of Fame — is secure, and her story in “Beautiful” continues to inspire and entertain. The national touring company of “Beautiful: The Carole King Story. : Book by Douglas McGrath. Words and music by Gerry Goffin & Carole King; Barry Mann & Cynthia Weil. Directed by Marc Bruni. Choreography by Josh Prince. Other credits: Derek McLane (Set Design), Alejo Vietti (Costume Design), Peter Kaczorowski (Lighting Design), Brian Ronan (Sound Design), Charles G. LaPointe (Wig and Hair Design), Steve Sidwell (Orchestrations and Music Arrangements), Jason Howland (Music Supervision) and John Miller (Music Coordination). At the Opera House, Washington Street, Boston, through Feb. 10. BroadwayinBoston.com. The Drifters. (l to r) Deon Releford-Lee, Nathan Andrew Riley, Michael Stiggers, Jr. and Dimitri Joseph Moïse.